Kevin Smith and Tom Henderson watch partner Denis O;Neill sink a birdie putt on hole 9…………. A very busy week, with 74 players in the scramble. With so many players it is odds on that some teams will be a players short, so the competitions committee have made provisions for this. With still 4 drives per player, the team has 6 spare drives as opposed to only 2 for a full team. Also the handicap allowance is 15% instead of 10%. For the first time since this was introduced a 3 person team was in the prizes, so it shows that a team short of a player can still be competitive. With some players unable to attend the prize giving last week for the strokeplay championship, they were able to collect this Friday. 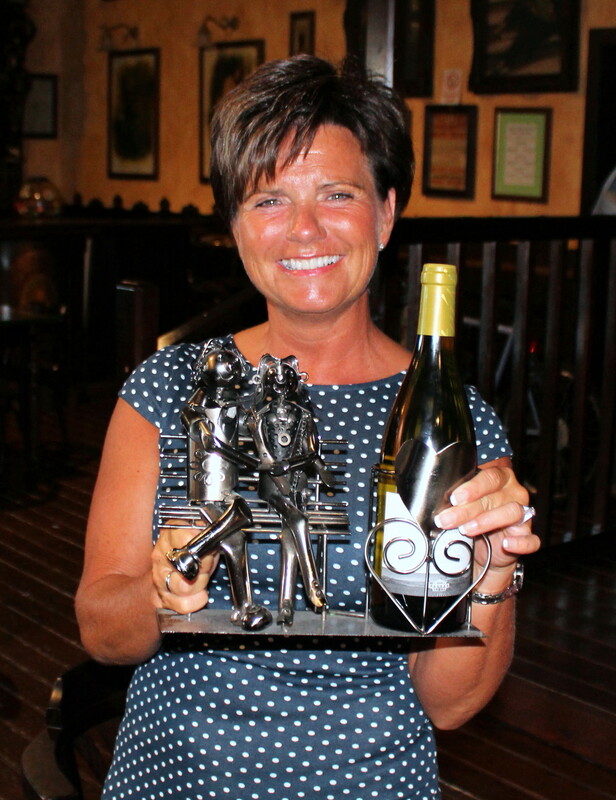 Mona Johannsen won the ladies division last week……. 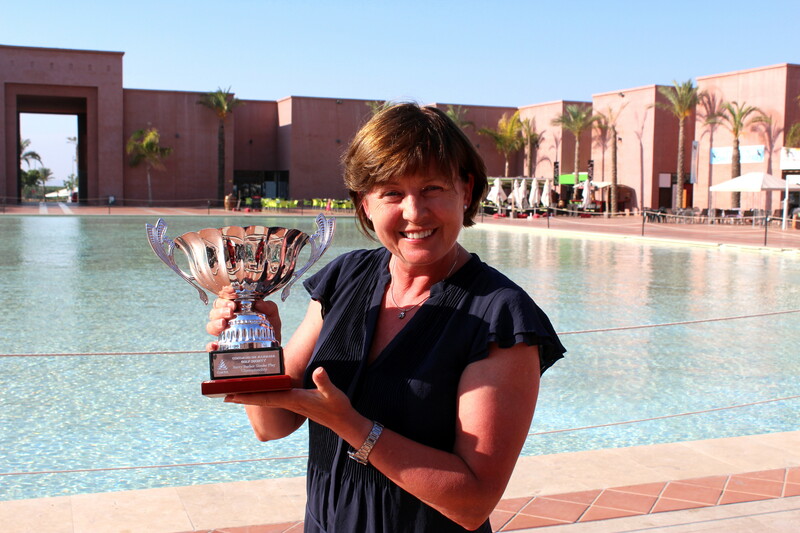 This photo of Annie Kittlesen will be displayed with the strokeplay trophy for the next 12 months….. I want to take this opportunity with this being a quiet week to mention our ex-greenkeeper, Alejandro. He helped to create our great course alongside the designer, Jack Nicklaus. Jack showed his appreciation by inviting Alejandro to his Memorial tournament in America because he must have seen something special about him. It was not long after that that we lost him, when he was headhunted to prepare the 2018 Ryder Cup course at Le National, Paris. I was watching the French Open a couple of weeks ago on Sky Sports when Ewan Murray mentioned Alejandro’s dedication and commitment in preparing and maintaining the course in such fantastic condition. It is nice to remember that he was our head greenkeeper in the good years when there was a lot of investment in the course (as possibly a Ryder Cup venue?). He was a very nice and approachable young man and it is good to see him doing so well. We will hear more in 2018 when Europe will claim the trophy again! For information for those not here and are worried about Neil, he is having a slight rest from his many duties, but is back in harness standing in as Dave Lloyd’s deputy. Lynn is making sure that he behaves himself (as normal!). A reminder to members that if you want to book a game on our booking service (bookings@cdagolf.com) that no matter how early you inform us, names are only added to the start sheet on the Wednesday roll up (2 days prior to the Friday competition). If you are actually on site before the Wednesday meeting it is better to enter your own name on the sheet in the golf shop. The next major competition is not far away. President’s day is on Friday August 14th and the sheet for that will go up in the shop this week. The evening presentation will be in Camposol golf club. Next week is a 4 person waltz with 2 counting on the par 2’s, 3 on the par 4’s and all to count on the par 5’s. 70 players played in the annual strokeplay event, and with every shot counting it was slow going under the baking sun. Unfortunately with some buggies out of action not everyone could have one, so some decided not to play, which was perfectly understandable. I realised why we only play it once a year when I worked out my score to 16 stableford points at halfway, which normally would be respectable. But with a 10 on the 2nd and an 11 on the 4th, my race was already run with no chance of a prize! I was actually surprised to see that all the prize winners managed par or better. Well done to Don Henry who has just started to play golf and in his first competition persevered with his card to win the booby prize! Well Don, things can only get better! It was disappointing to find that 3 players who booked in on the society booking service did not show, and did not let any committee member know. With a full start sheet some players may have been denied a place, so these golfers will not be allowed to use the service again. It was brought to my attention before play that some of the bunkers on the course were infested with wasps, and it was not safe to enter. So common sense prevailed and any player who felt unsafe was allowed to drop out under penalty of one stroke. the Von Trapp family of golf? The Markenfelts, Simon, Daniel and Christopher……..
Barry Answer is a little confused as to which club to take………. this nest of eggs had been raided, but only 2 metres from the 1st tee?……. Thanks to Lisa and Sue for handing out cold drinks to the golfers on the 12th tee, and also to Kevin and Neil for managing the scores. Annie was the clear winner…………..
Christian played the best golf of the day………..
10 year old Seb Cave just beaten on countback for division 2………………………. Size is not important! Simon beat all the big guys to the nearest the pin prize on 17 (off the yellow tees!)……….. Kirsti won the ladies’ nearest pin prize……..
a consolation prize Don a 2015 calendar (plus a bottle of brandy to help you forget!)…………. Alicia also played a big part in dealing with the cards and was responsible for making sure that everything at the evening presentation at Totana tennis club went off smoothly. She got a bottle of Cava (reserva) to take on her holidays this weekend. The views from the terrace over the Guadalentin plain with Condado in the distance were truly amazing. As usual, Dee gave us a great evening of entertainment and as a surprise for my birthday arranged a stripper. I thought all my birthdays had come at once, but unfortunately the stripper was me! Dee was more like a comedian in her first spot…………..
Dee had some competition for our attention………..
Barry thought he had cracked it when Dee chose him to be his ‘private dancer’ (accompanied by the song)…………..
what she didn’t tell me was that I was to be the stripper…..boo-hoo! it was good to see my Susie back in action…..the hip is working well………. the lights of Totana and Condado were the view from the terrace……..
Jim leads the conga through the bar………. Dave Storey does his own conga on the way home…..well, the wine was free……..
Ken and Alicia look like the alcohol is working…..
Martina and Jim take the floor………..
Dave and Carol are looking good………. 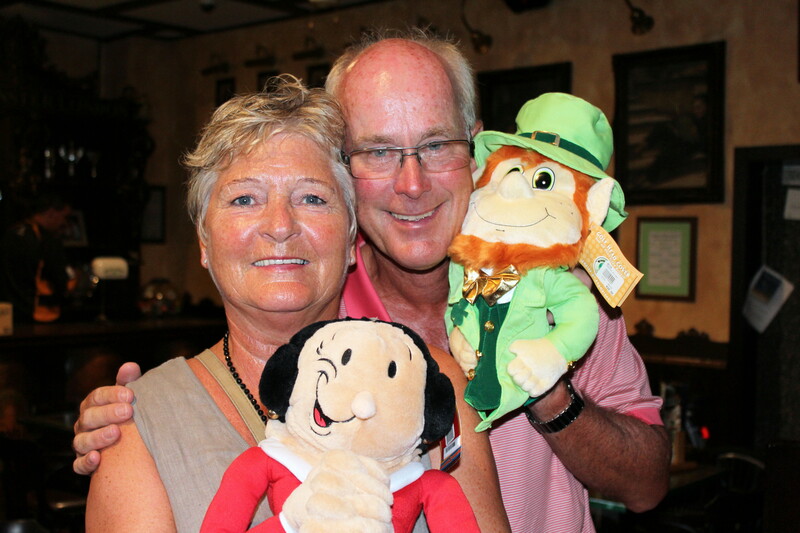 the Vivians came all the way from New Zealand to join us….. 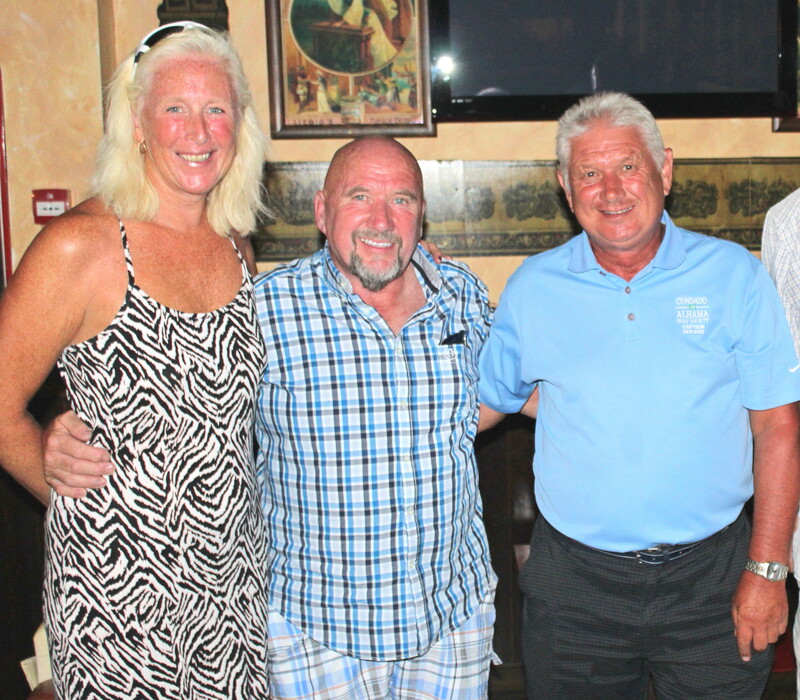 I hope these photos have given you all an idea of the good time we had, so come along to the next one (President’s Day August 14th at Camposol golf club). the mounds on the 2nd are now back in play…..
We had 59 players in the pairs aggregate competition, and it was another hot one, with the breeze coming too late to save the players from the ravages of the burning sun. It was a nice change to play a pairs competition, maybe we should have more. Terry Burgess came out on top, but was very nearly beaten by himself! Dave Cooke didn’t have a partner so a draw was made for a ghost card to make up his team. With Terry’s card coming out it meant that the ghost team had a higher score than the winners, so as the ghost could not get a prize Dave would have been paid out and Terry would have been 2nd! Common sense prevailed and another draw made (without the winners included) and Terry finally got his winners prize that his 40pts deserved! Neil took over the presentation with captain Dave Lloyd back in the UK for the summer. I think he mentioned Les Hurren missing a 6 inch putt on the last about 4 times, as this meant that Neil’s team beat Les’ on countback! Alicia is usually on stage almost weekly getting some prize or other, but this week she was on all the photos as Neil’s sidekick. A very busy lady, just back from holiday she has to update the society accounts, arrange the evening party next week and key in all today’s scores to update the handicaps. Also thanks to Kam Cheema and Paul Coopey for acting as starters. the Yorkshire duo me and Charlie………..
a change of partners – Les & Kev………. It wasn’t Jostein Landsvik and Reidar Tornoe’s day………………. On Wednesday I met a fan of the blog. Gerry (frae Glasgae) lives on site and does not play golf, but enjoys reading the blog every week, especially the jokes. So this week I have included some scottish jokes especially for him. He may have heard them all, but they be new to the rest of you. With no comments available (like EOS) it is nice to know that someone likes it! . How do you know when you’re staying in Glasgow? When you call the hotel desk and say “I’ve gotta leak in my sink” and the response is “go ahead”. A pregnant teenage girl phones her dad at midnight and says: “Can ye come and get me? I think ma water has broken”. “Okay,” says her dad. “Where are you ringing from?”. “Frae ma knickers tae ma feet!”. After announcing he’s getting married, a boy tells his pal he’ll be wearing a kilt at the ceremony. “And what’s the tartan?” asks his mate. “Oh, she’ll be wearing a white dress”. Did you hear about the London criminal who fell foul of the Glasgow Mafia? Apparently they made him an offer he couldn’t understand. Didn’t get home from Holiday until too late for the presentation, so here is Dave Lloyd’s take on the day’s play.This week the winner was Peter Reeves with 42 points – nice to see him make an effort at the presentation! There were 56 players in the competition, including 10 ladies and 3 guests. I hope you all enjoyed it. The course is getting better and the greens are almost back to being back to normal. Thank you very much to Apollo Air for their continued sponsorship. They are the number one A/C suppliers on Condado. Their details can be found in the fixtures diary. Also big thanks to Peter Ridley for starting today, volunteers are a big help at any time of the year, but during our busy summer period are invaluable. If you would like to help, ask the committee and we will add you to the list. At the moment we have had Barry, Dave Rollett, Phil and Alicia away on holiday, and next week Dave and Kim go by to the UK for summer, so there is a big burden on the few committee members remaining. Massive thanks to our hosts at the Clover bar. They are brilliant in giving us a base for our society, and the sandwiches they supply after our events are a fantastic gesture. We are so lucky! We had a great game today playing with good friends Kevin Smith, Les Hurren (and Kim!) on my last game at Condado for a few weeks due to returning to the Uk for the summer. I have to say, we all played well, and although we were not in the prizes as Kevin said, we were very unlucky. The next major competition is the Barry Barker strokeplay on July 17th. The start sheet for the golf is on the noticeboard now. Anyone who is here at the moment and would like to attend the evening presentation at Totana tennis club please see Kim to add their names onto the list for tickets priced at 15€ (including entertainment and meal) with transport at an optional 5€. This is 1st come, 1st served, so please add your name early to avoid disappointment. It will be great entertainment with Dee, who must be one of the best in the area. I am disappointed not to be here for this event which I am sure will be very good. I am sure someone will take over the singing on the return bus journey to Condado.I would like to wish the vice captain, Neil Simpson, the best of luck in taking over while I am away. Please be gentle with him as he is a little bit shy! It was a little breezy early on, but all players suffered from the wind. I told Kev on Wednesday to keep off the beans but he did not listen. Thomas O’Brian had to play his 2nd to the 9th from the 18th tee box. Never mind Tom, you will soon find your way around the course! Jose our friendly barman with thirsty golfers……. on Fridays Jose puts these reserved signs out……………. fly repellent glasses with instructions…….